Lemon Shrimp, Filet Mignon, are some of the main courses this week. Mix 1 tsp garlic and 2 tsp paprika in a small bowl. Add shrimp and toss to coat. 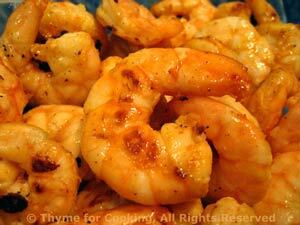 To cook on barbecue either put shrimp on skewers or cook in perforated grill pan with a little olive oil. To cook on stove add a little olive oil to a large frying pan and sauté over medium-high heat for 3-5 minutes - until shrimp curl and turn opaque. When done, remove from heat, toss with butter sauce and serve. Melt butter in small pan. Add garlic, 1 tsp paprika and sauté until garlic is tender, 2 - 3 minutes. Add lemon juice and whisk lightly to combine. Small, thick-cut filet mignon are perfect done on the barbecue grill. A wrap of bacon adds flavor and helps the steak stay moist. 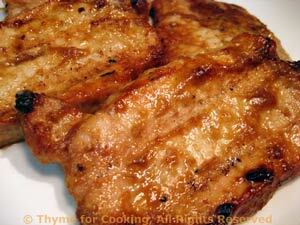 We've painted these with a light marinade and served with some savory glazed mushrooms. Wrap bacon around steaks (if using) and secure with toothpicks or kitchen string. Mix Worcestershire sauce, oil, ketchup, oregano, chili, garlic and brush on steaks. Set aside. Heat butter and Worcestershire in medium nonstick skillet over medium heat. 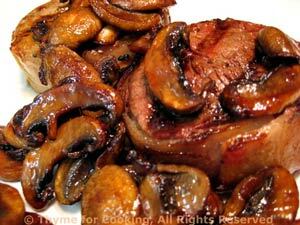 Add mushrooms and sauté, stirring frequently, until they are dark and glazed, about 10 minutes. You may have to turn the heat down a bit after 7 or 8 minutes. Set aside and partially cover to keep warm. Cook steaks on barbecue grill until done to your liking. We'll cook ours about 3 minutes per side for medium rare, 4 - 5 minutes per side for medium, but it depends on.... thickness of steak, heat of grill, etc. 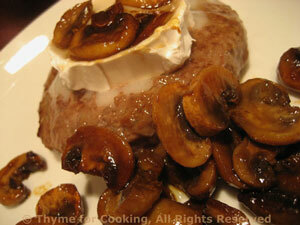 Put a steak on each plate, spoon mushrooms on the side and serve. Note: Could be done under the broiler (grill) for about the same time. If you want cold chicken leftovers, do a whole chicken, otherwise just do your favorite pieces. 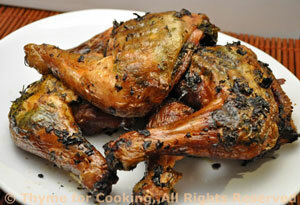 The herb mixture is enough for a whole chicken. 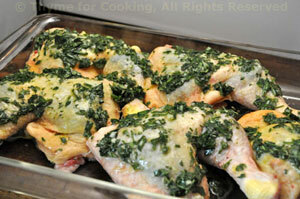 If you do the equivalent of half of a chicken (2 thighs and 2 legs would be my choice) cut the herb mix in half. If you don't have all of the herbs, just leave them out rather than use dried. If you have no fresh herbs, substitute 1/4 the amount, dried. Early in the day or the night before snip, chop and mince herbs, garlic - you're making a paste so they should be fairly fine. 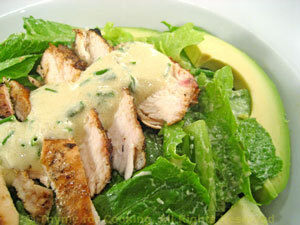 Put all into a small bowl and add the lemon juice, salt and pepper. Mix well. Add enough olive oil to make a thin paste - it won't hold together but it shouldn't be like a vinaigrette. With your fingers take a bit of the herb mixture and put it under the skin, smoothing it over the flesh. Stretch the skin to cover and put in a glass baking dish of some sort, just large enough to hold all of the pieces. You will want to put about half of the mixture under the skin of the pieces. When finished, add a bit more oil to the remaining herb mixture and rub/pour over the the top of the pieces. Cover with film and refrigerate until ready to cook. Cook on barbecue grill for 30 - 45 minutes. Chicken is done at 170F (76C) or when juices run clear - poke with a skewer or knife. Thighs and legs take a bit longer than breasts. Try not to overcook. Start it over direct heat, but watch carefully - the oil will cause flair-ups. Once it gets some nice color/flavor move it to indirect heat, close cover and let finish cooking.